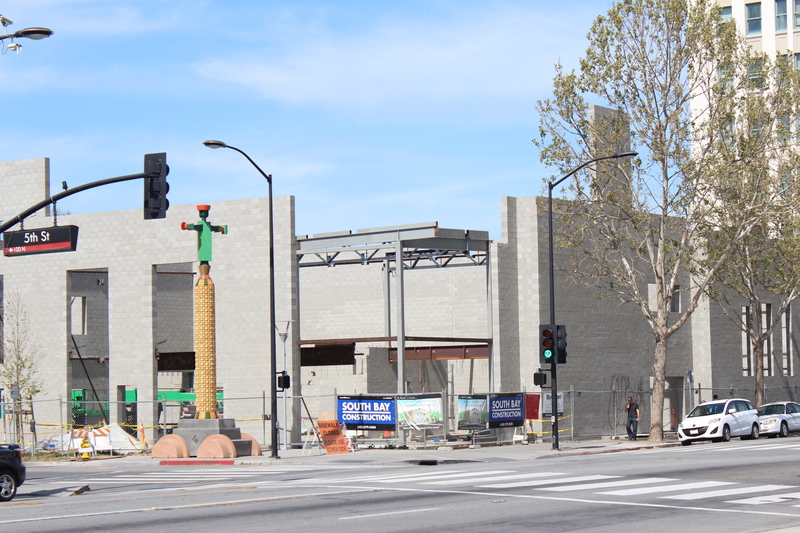 Welcome to the new home of San Jose First United Methodist Church – Building Committee Update. 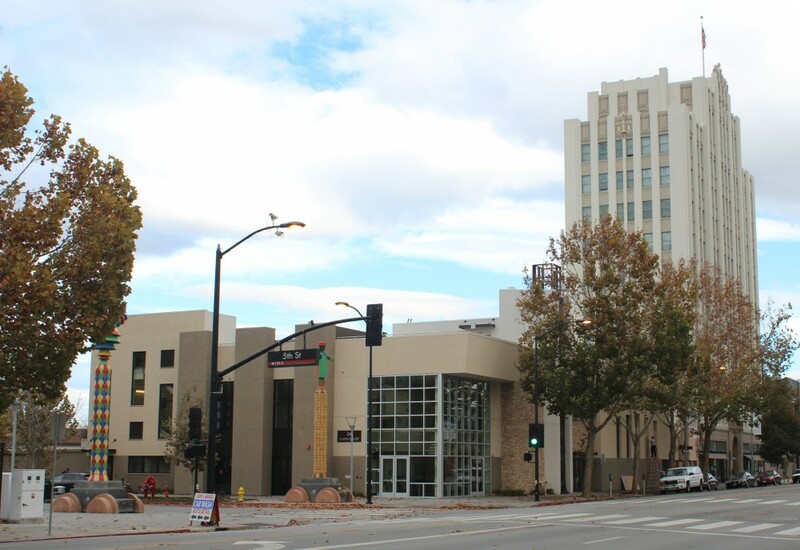 This dedicated domain name – sanjosefirst.com – will provide improved flexibility for maintaining our blog, enable future archiving and documentation production, provide a home for additional construction pictures, and ensure compatibility with our Church web site: sanjosefirst.org. 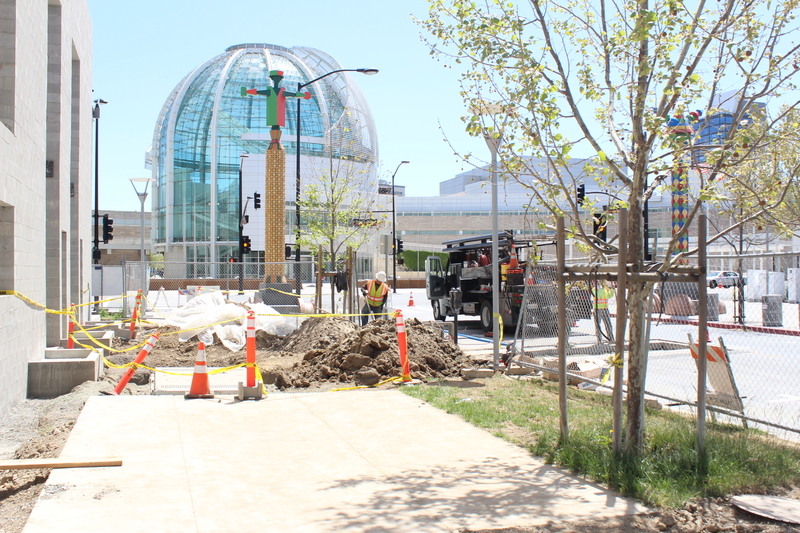 Following this posting we will provide an update on construction since our last posting April 16th and then commence with updates on a regular basis. 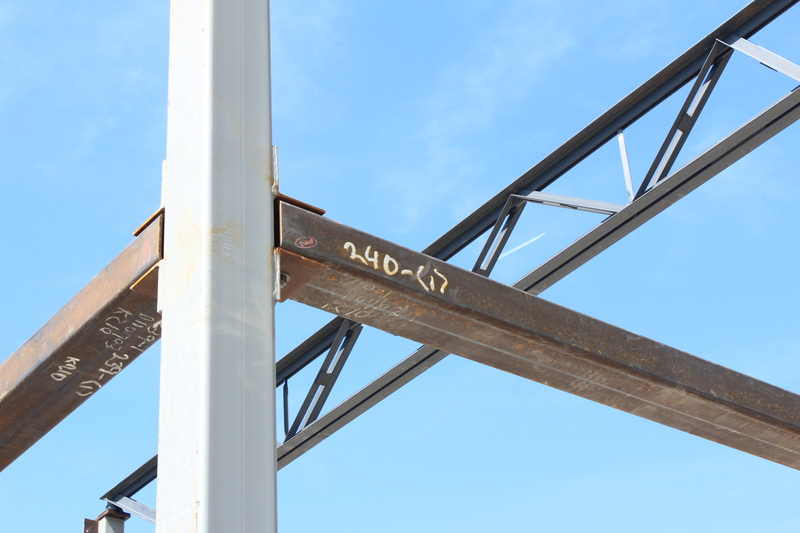 The Open Web Steel Joist (OWSJ) system of trusses used in the Church provides very strong support for vertical loads. 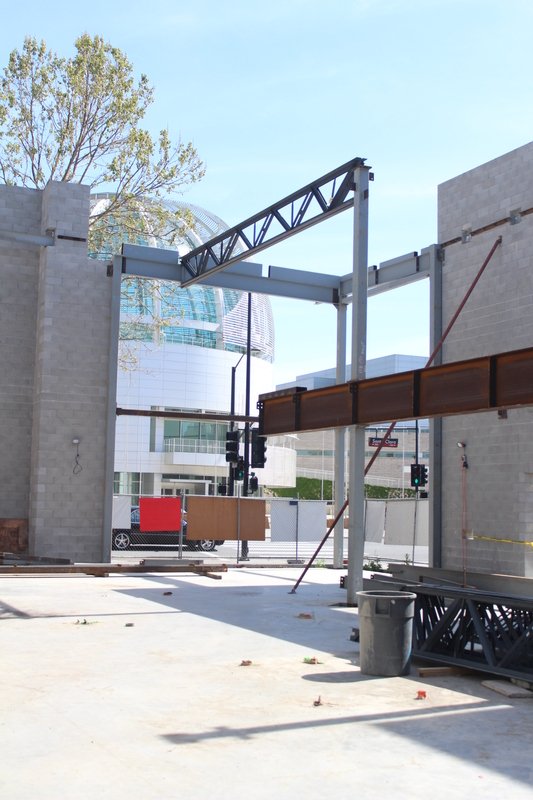 Trusses are not meant to handle lateral (from the side) loads. 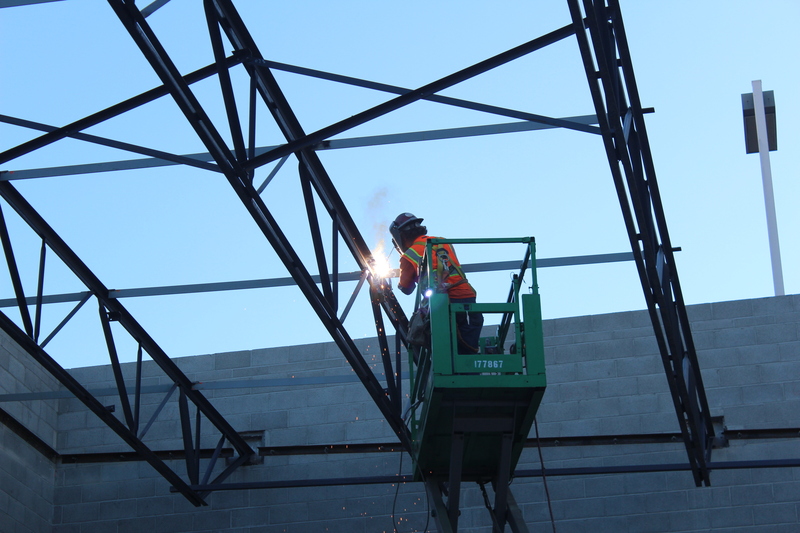 The cross braces being welded into place in the pictures below lock the truss structure together and strengthen the entire super structure of the Church. 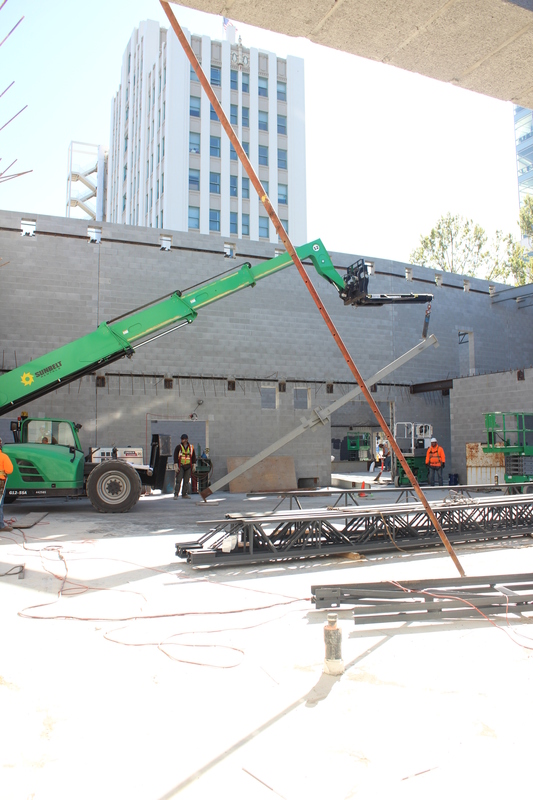 These pictures were taken on April 15th while additional cross bracing was being added to the south end of the sanctuary. 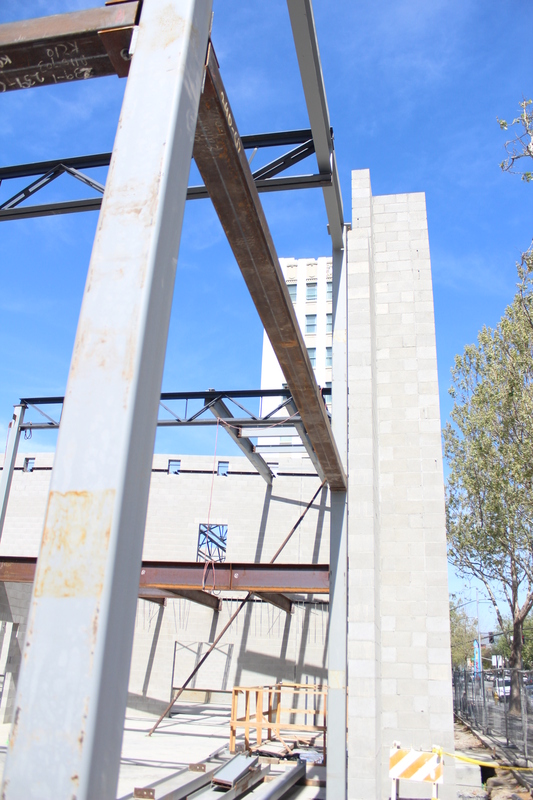 Vertical support for most of the steel structure up to this point has been provided by the walls constructed using the Concrete Masonry Unit (CMU) approach. 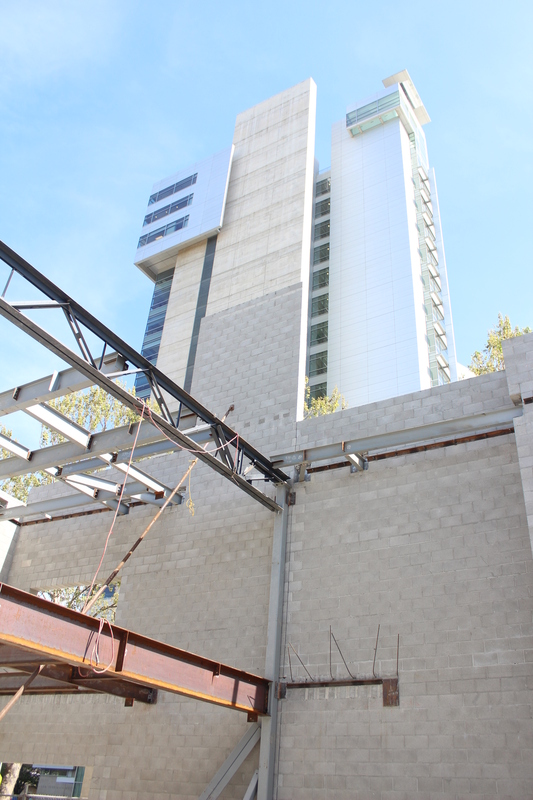 As the construction moved to the Western section of the building vertical supports had to be placed in areas without walls. 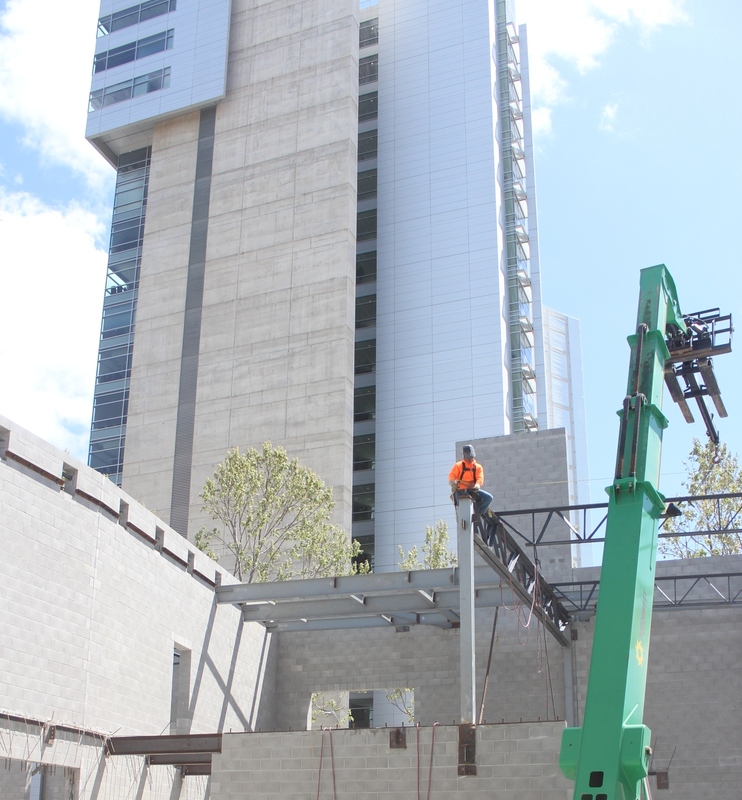 The pictures below show the sequence of events used to install medium sized columns. 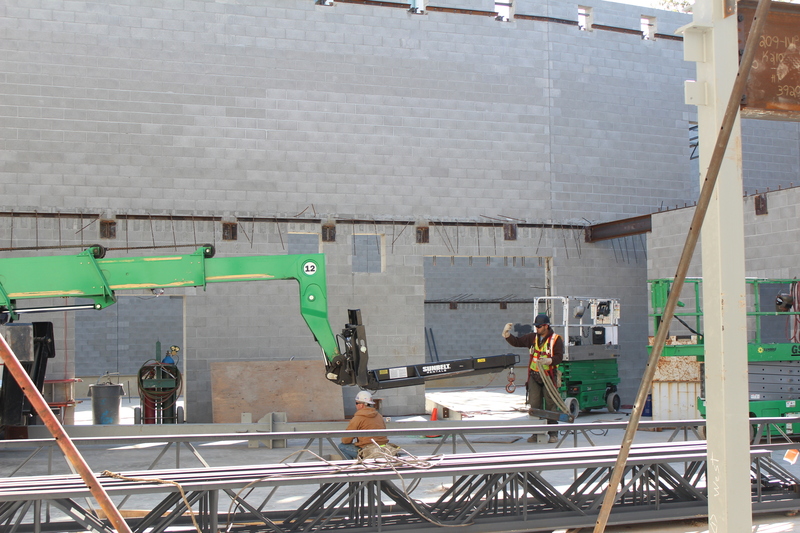 There will also be large columns in the back of the sanctuary for additional support. 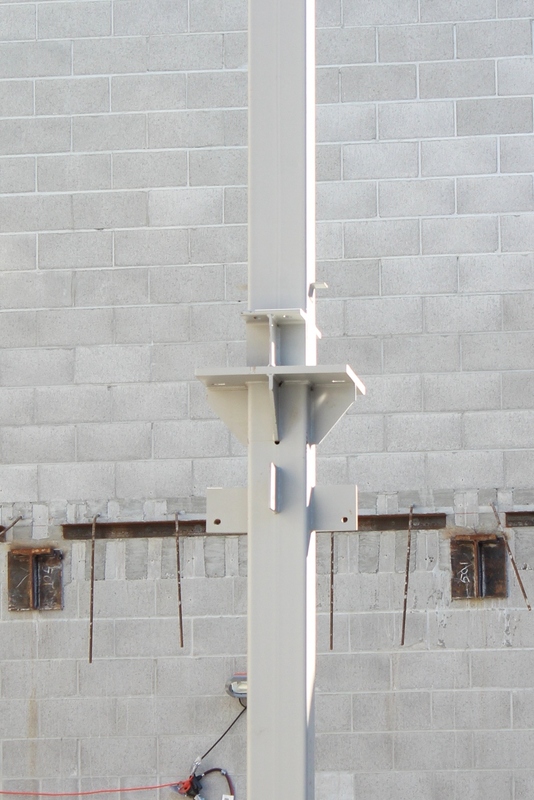 Columns are designed to support vertical loads. The have some resistance to lateral loads. To ensure lateral support columns are braced side to side. This picture shows attatchment points on one of the columns. 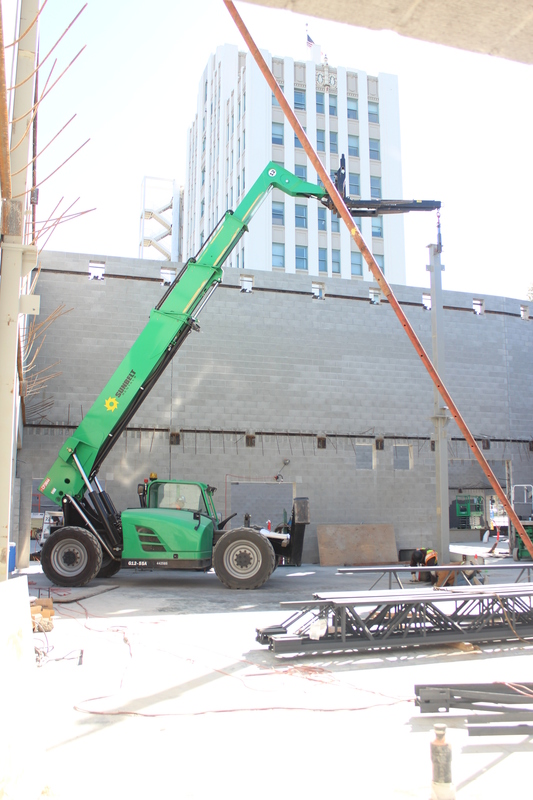 Over the course of the last week the water connection to the Church has been completed. 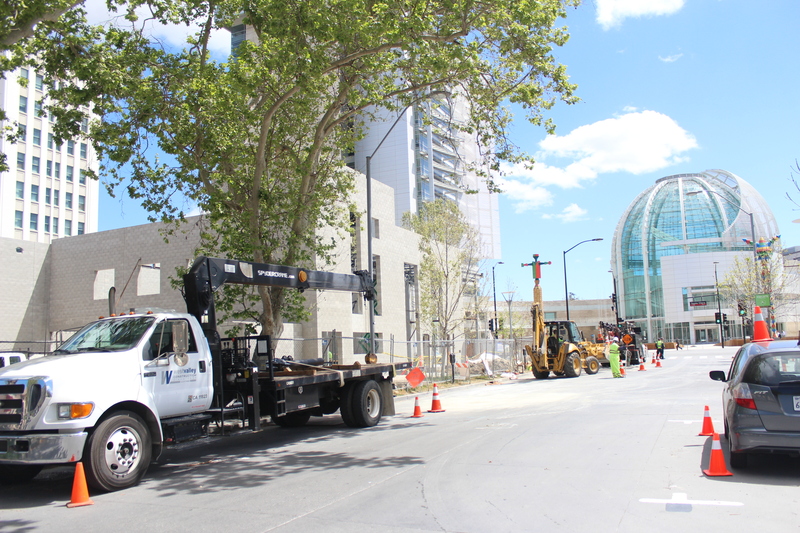 The photos below show the workers as they finished the connection and replaced the portion of the pavement that was removed to make the connection. 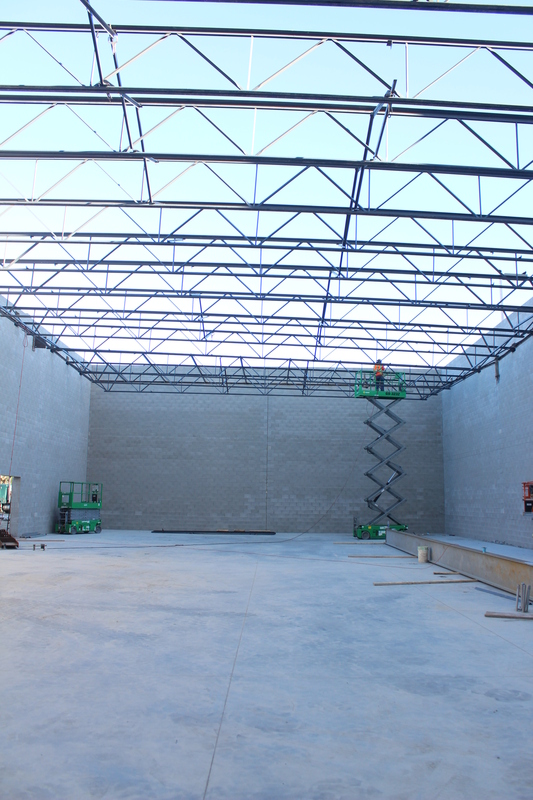 Still to be completed is the addition of back-flow valves that prevent water from entering public water supply from the Church in case of a pressure buildup in the Church or sudden drop of pressure in the water supply system feeding the Church. 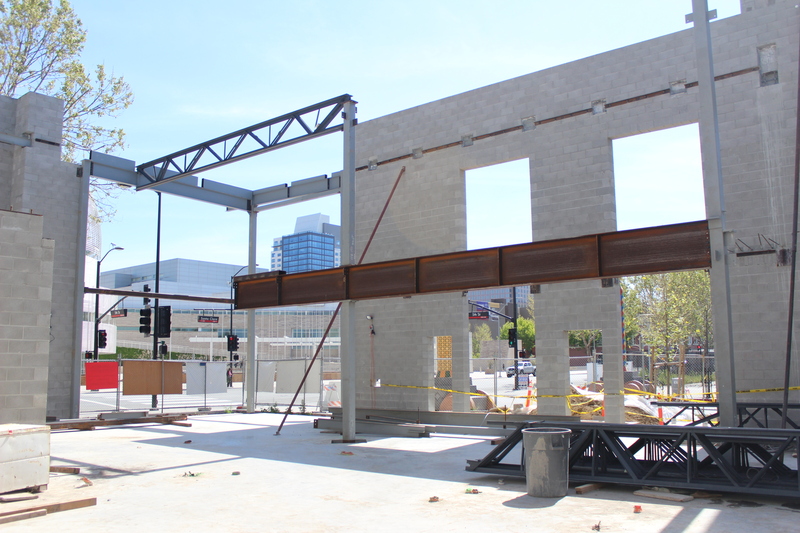 The pictures below were taken on April 15th. 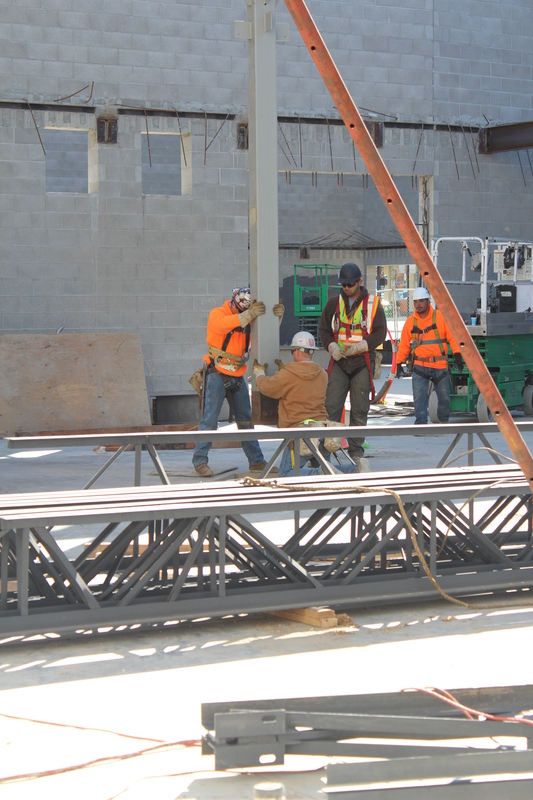 Work on the columns, beams and truss structures surrounding the atrium and the roof above continues. 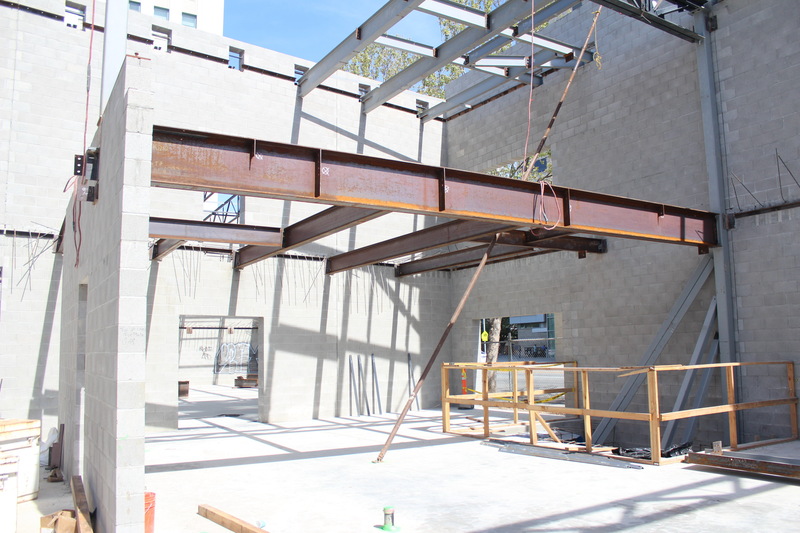 The pictures below show the huge beams that frame the atrium as well as the truss structure that is taking place above it. These pictures were taken April 15th. 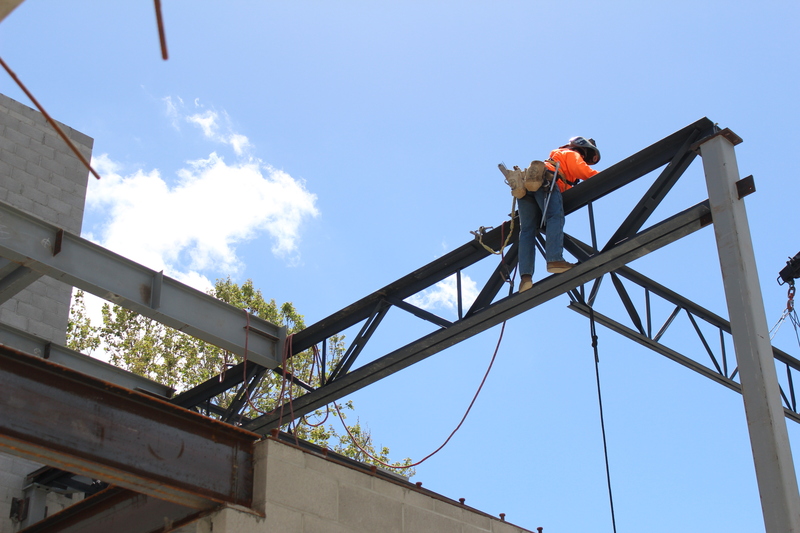 Significant progress was made in the atrium area this week as structural steel framing was started in the western side of the building. Shape of the atrium including the second floor quiet space at the top of the stairs an be clearly seen. 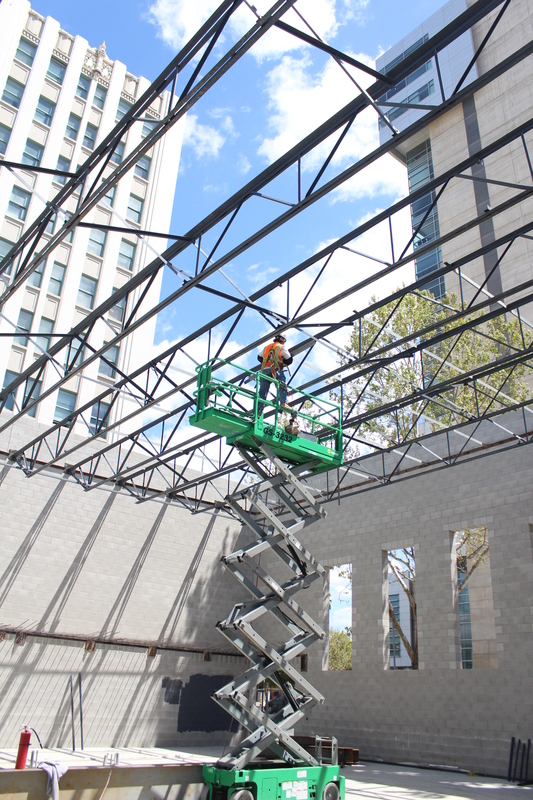 While strong and secure, the steel structure of the church is also simple, solid and well thought out. 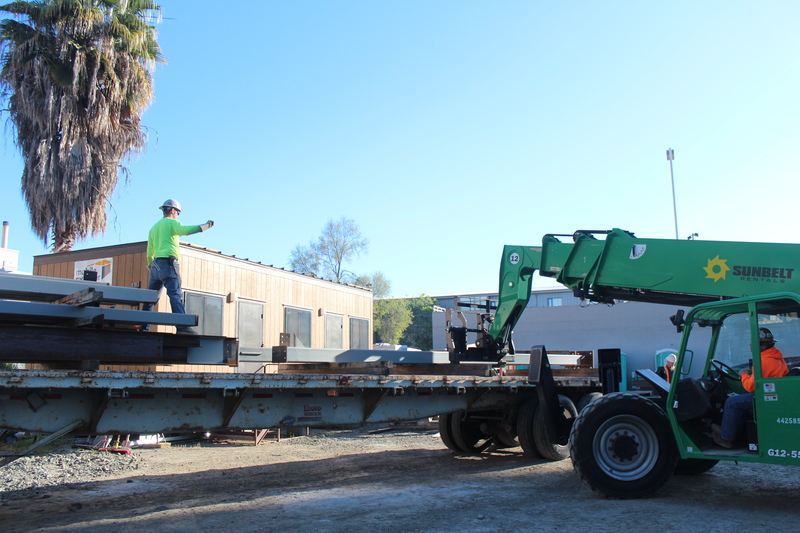 This design was significantly less expensive than previous plans and a major reason we were able to proceed with the project. 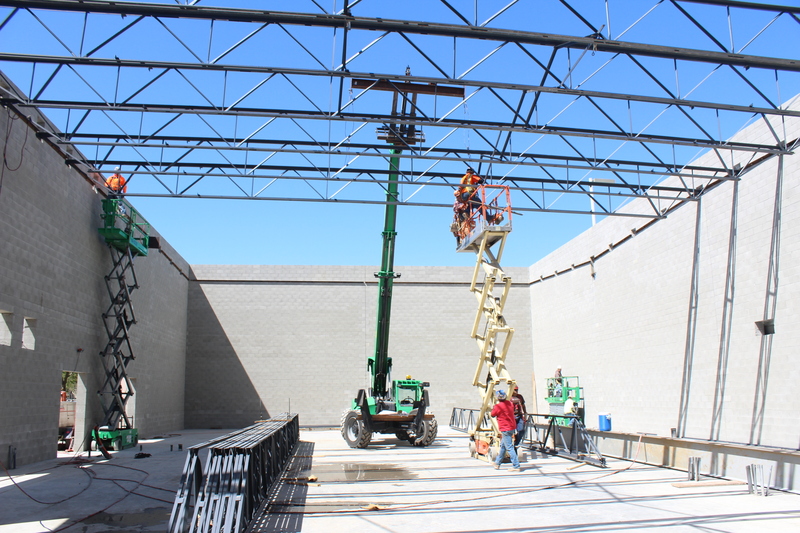 Additional beams and trusses will be installed next week. 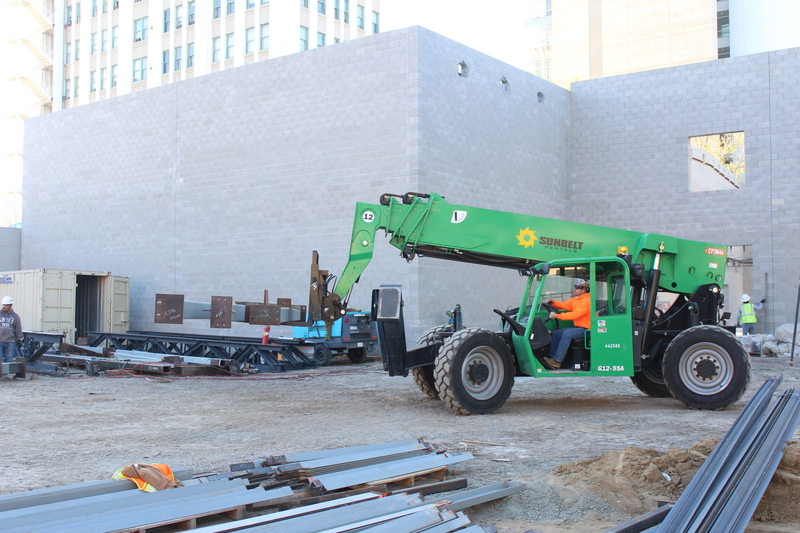 The pictures below were taken as work wrapped up for the week earlier today. 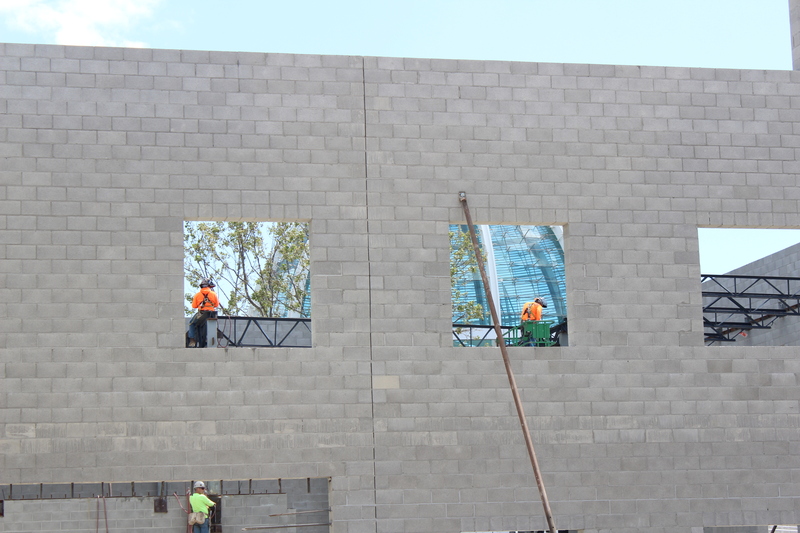 The three pictures below frame the community service room. 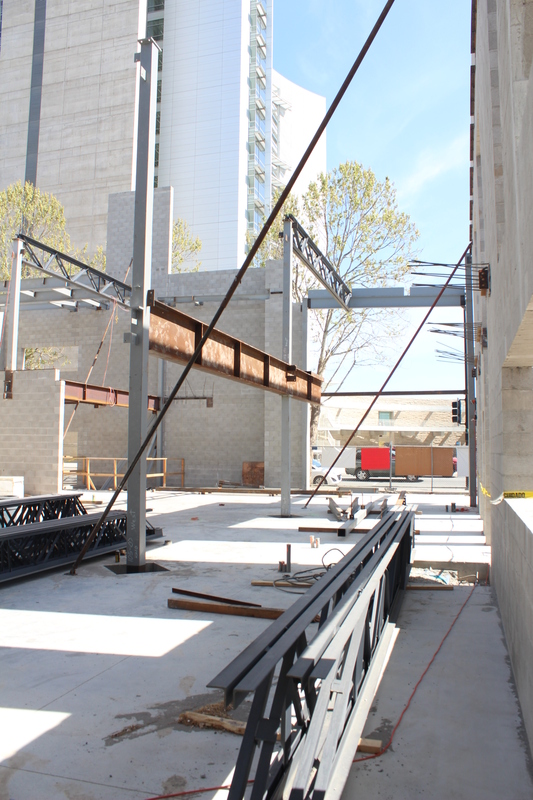 This view was taken from what will be the narthex looking south west. 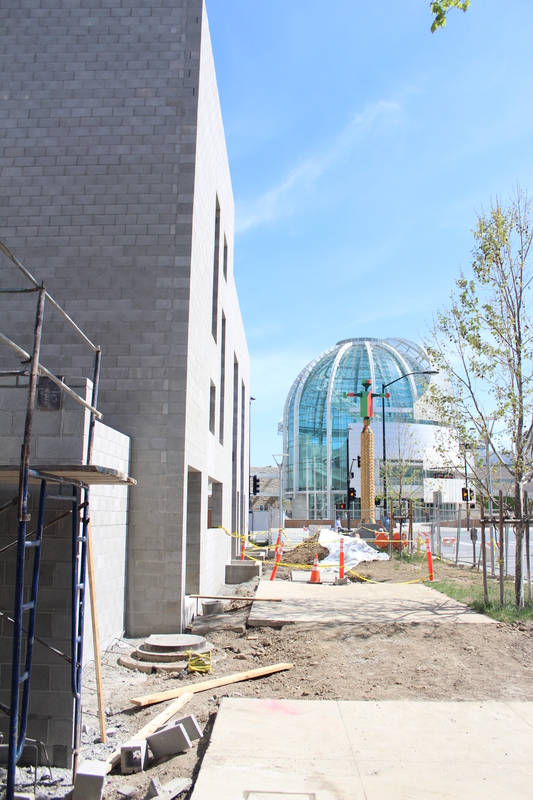 The corner of the community service room and atrium are framed by the rotunda in this view. 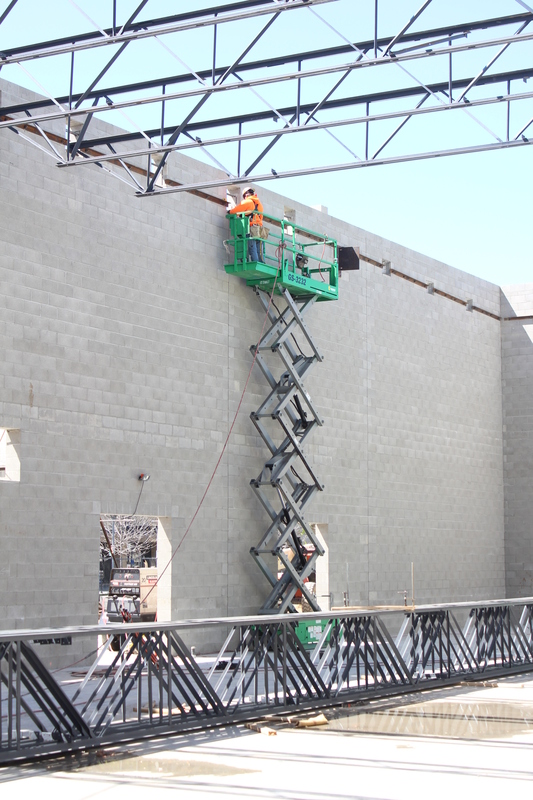 In this view the east wall of the community service can be visualized although not yet in place. 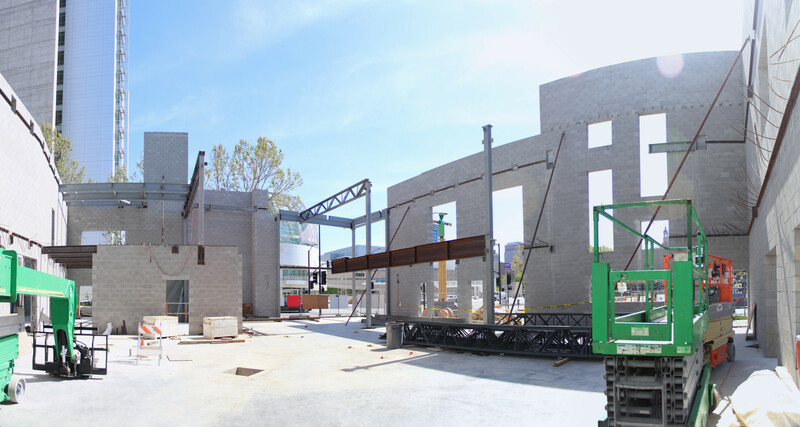 This view was taken outside the Church and shows the bike racks, pre-school entrance and Community Service room doorway, framed by the rotunda. 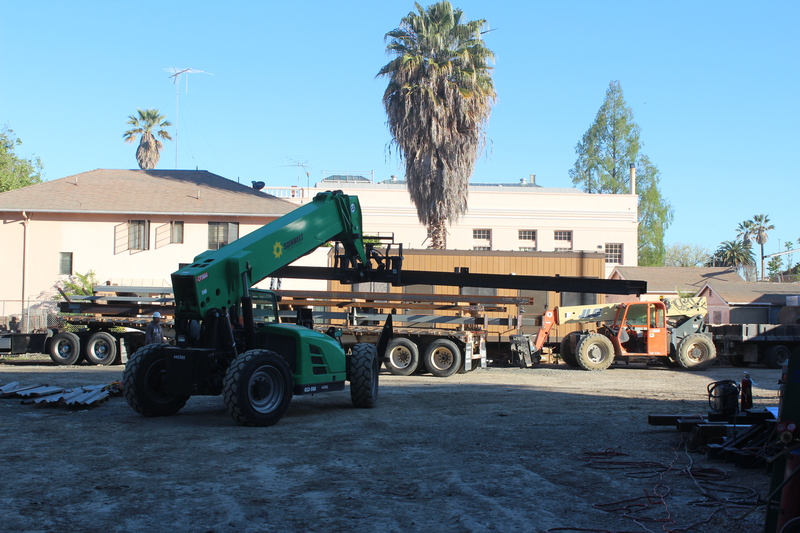 Another shipment of steel arrived yesterday. 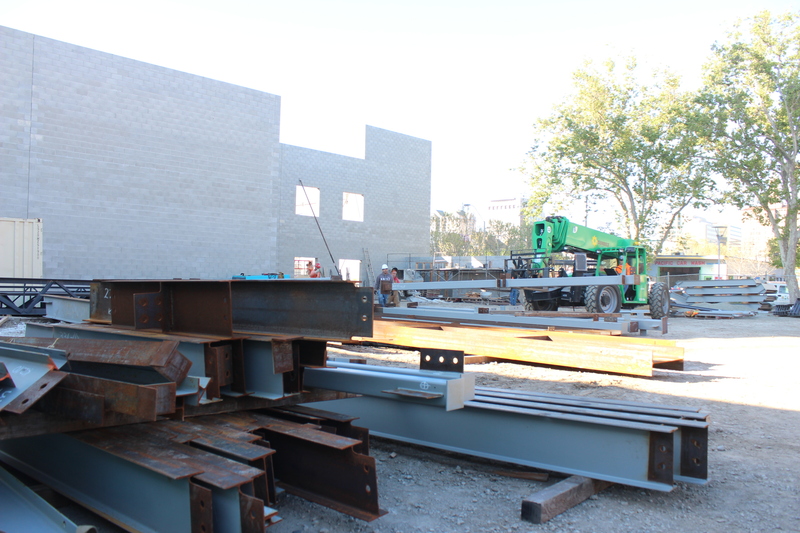 This shipment included steel beams that will provide vertical support in portions of the eastern section of the building. 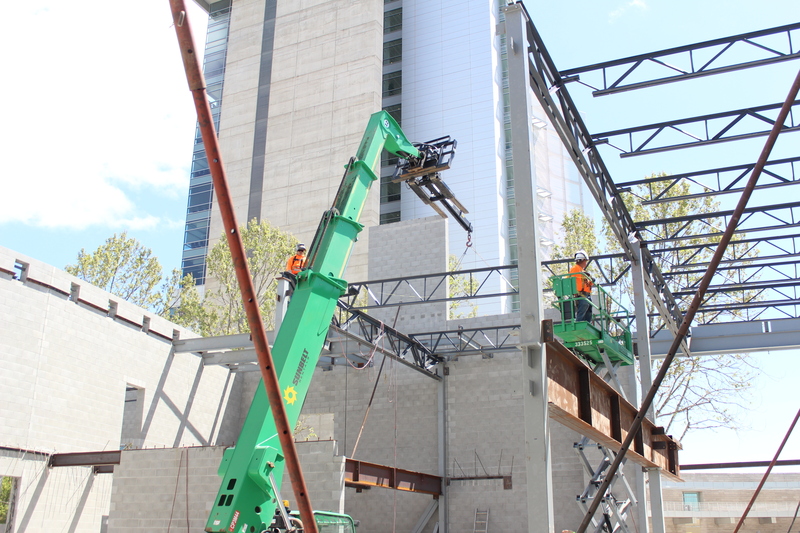 Truss system for the east side of the building over the sanctuary, pre-school 3, multi-purpose room and youth room is progressing. 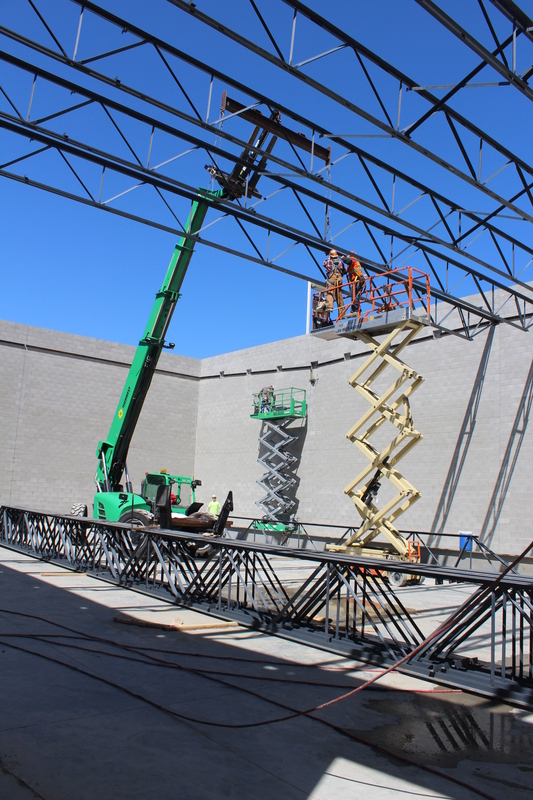 The pictures below show progress of installing the truss system. 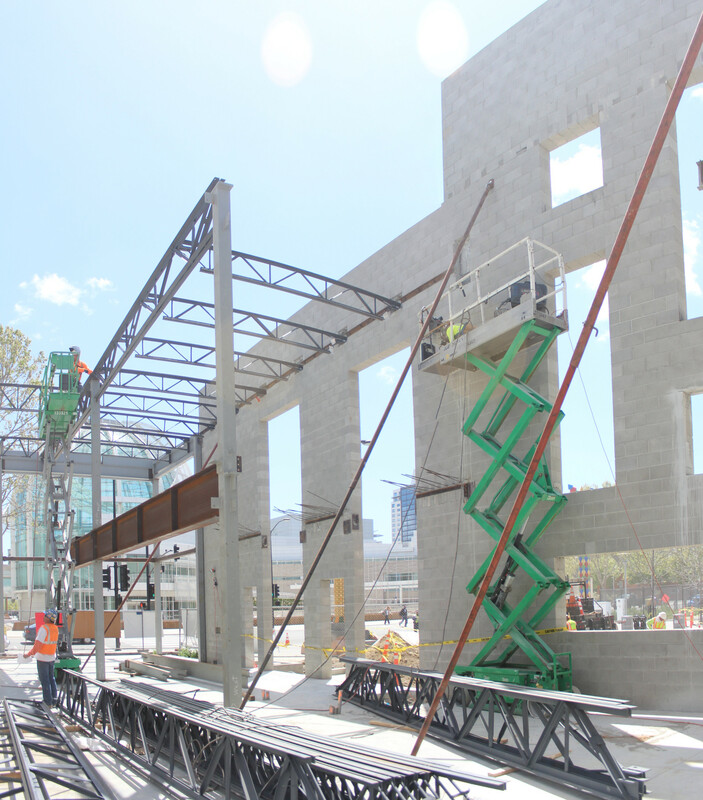 After trusses are installed cross-bracing is welded in place for horizontal stability Trusses are designed to support vertical load but do not support moments and are not intended for large horizontal loads. 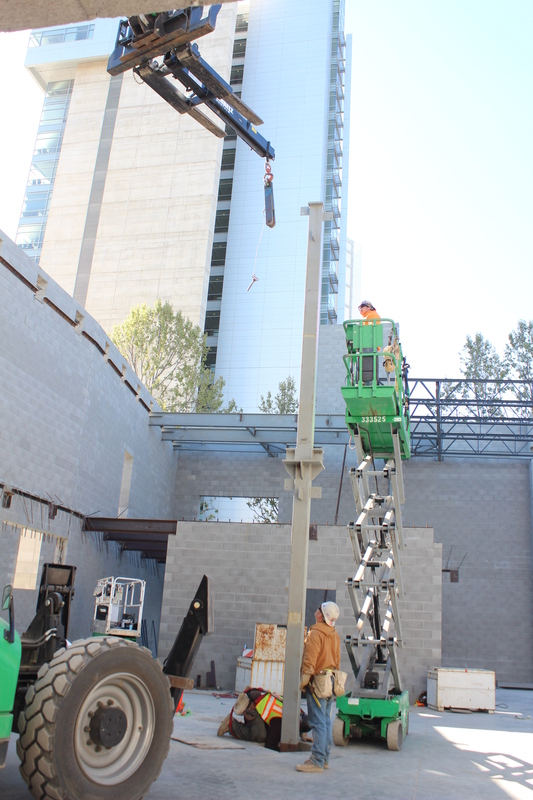 Today the steel erection team continued installation of the steel truss system over the sanctuary. 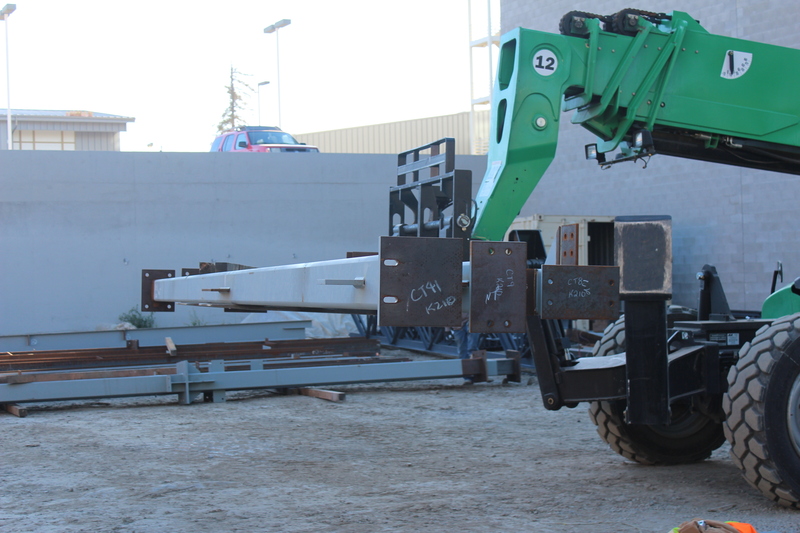 The first step is to prepare the support platforms previously installed by the masonry teams. 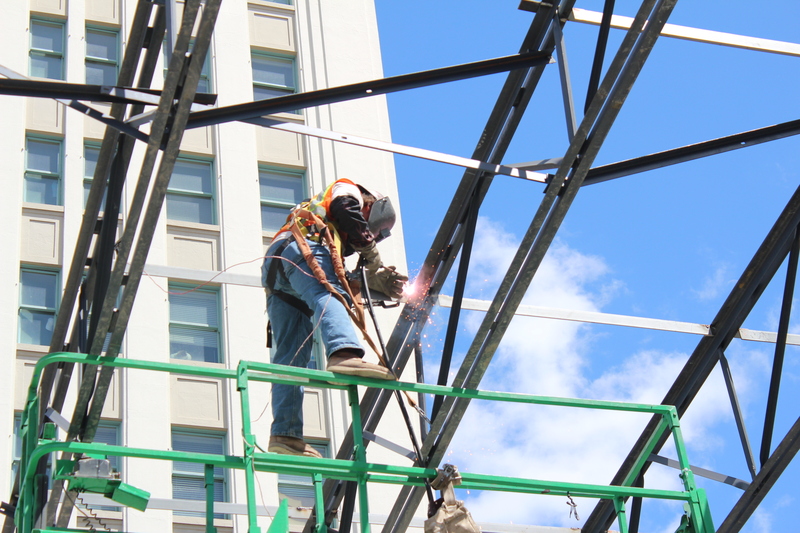 Once it has been inspected, cleaned and prepared for welding the truss can be put in place. 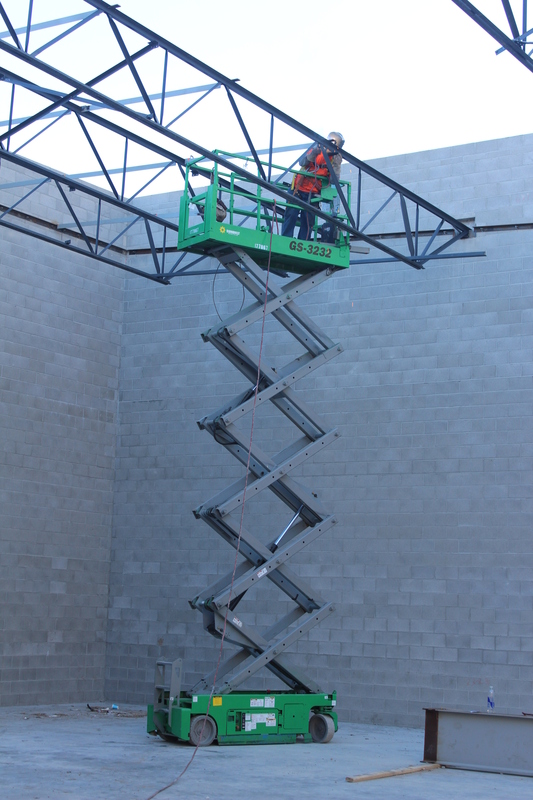 The high-lifter (capacity 10.000 lbs) positions a truss (weights less than 1,000 lbs) in place. 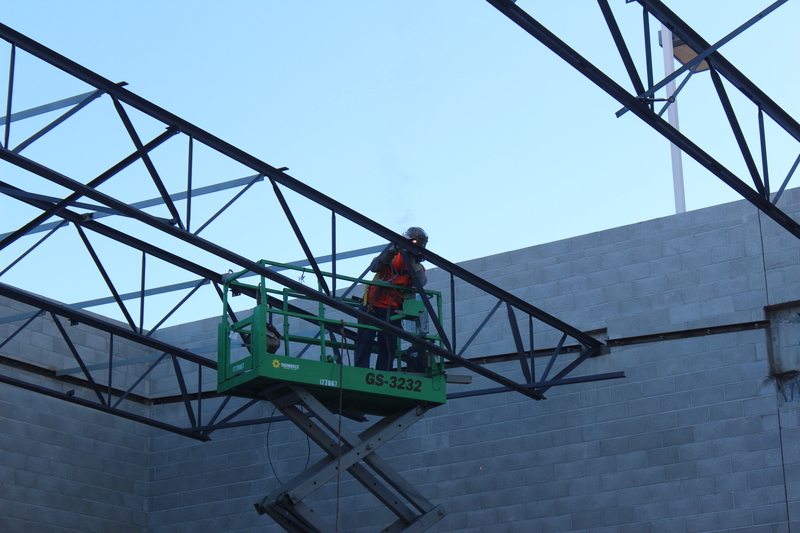 Once trusses are lifted into place they are welded to the side walls and cross braced to each other. 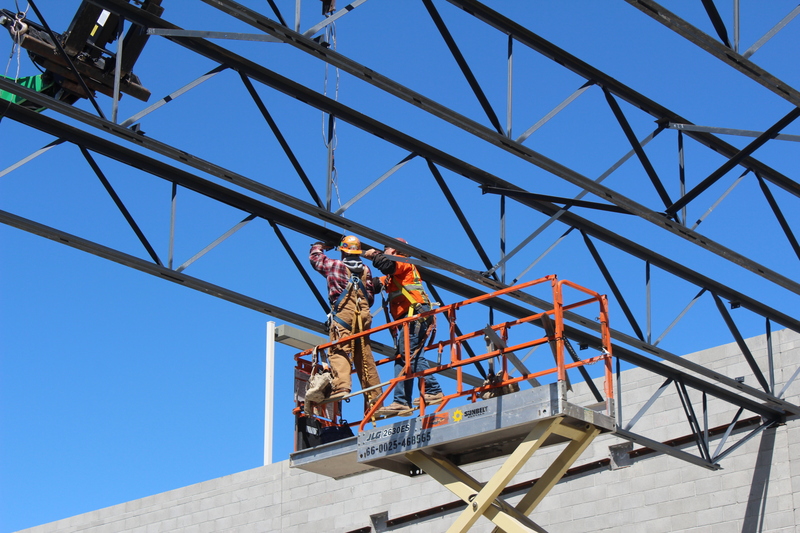 Notice the cross-bracing from previous truss (look carefully for the triangle shape structures behind the installers heads on previous trusses). 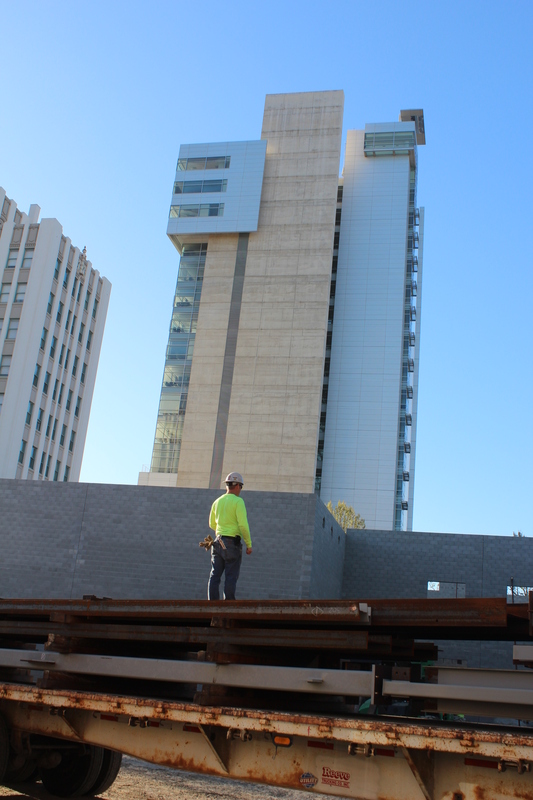 This is the view from Sanctuary Santa Clara Street wall (South wall) looking north.